The Go-To Electric Guitar Speaker! The Electro-Voice EVM12L Classic loudspeaker has been frequently referred to as "the world's greatest guitar speaker." Whether or not such a monumental question can ever be settled, there's no question that the EVM12L loudspeaker has been much beloved and extremely popular, ever since it was released in 1983. It's a 12-inch transducer with a 2-inch cone and a hefty 16 pound magnet. It runs with an 8 ohm nominal impedance, and is ready to move serious air with 200 watts of power handling. Technically speaking, the EVM12Ls have a frequency response of 80 Hz to 7 kHz (-10 dB), and a maximum SPL of 125 dB. They handle 200 watts of continuous power and 1000 watts at peak. The EVM12L has long been favored by guitarists in particular. That's because it is a speaker capable of rendering not only the complex high transients and wide midrange of electric guitar tones, but the low mids and undertones as well, especially if you're applying crunch or distortion effects that create rumbling lows. 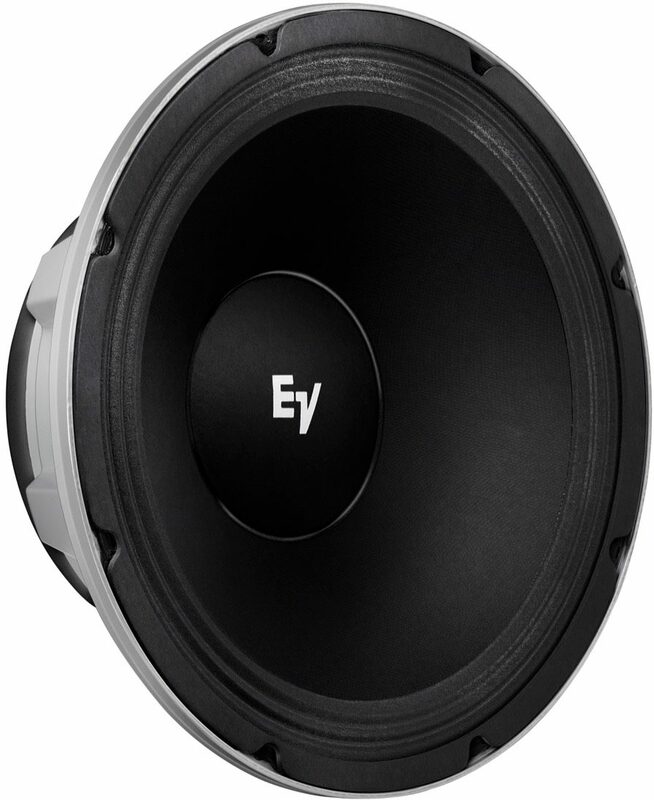 The EVM12L is frequently used to replace stock cabinet speakers or to replace ones you "accidentally" blew out. Oops! Guess I gotta get myself a set of EVM12Ls! They boast superior power-to-heat efficiency than most other loudspeakers, and will sound excellent in virtually any sealed, vented, or open-backed enclosure. In open-backed enclosures, the EVM12Ls shine, as their exceptional rich mid bass is accentuated. In sealed enclosures, the EVM12L delivers punchy and powerful performance, with rich low end along with great detail in the upper mids and highs. zZounds is an authorized dealer of Electro-Voice products. Electro Voice Warranty ﻿Electro-Voice offers the following warranties: 5 years on speakers; 3 years on electronics; and 2 years on microphones. The original EVM12L 12-inch loudspeaker was introduced in 1983. Known for its huge tone, gorgeous low-end and incredible stability at extreme volumes, it quickly achieved legendary status. Top guitarists and bassists loved it not only for its sound, but also for its reliability. Tour after tour, the EVM12L held up to the demands of the most punishing players. 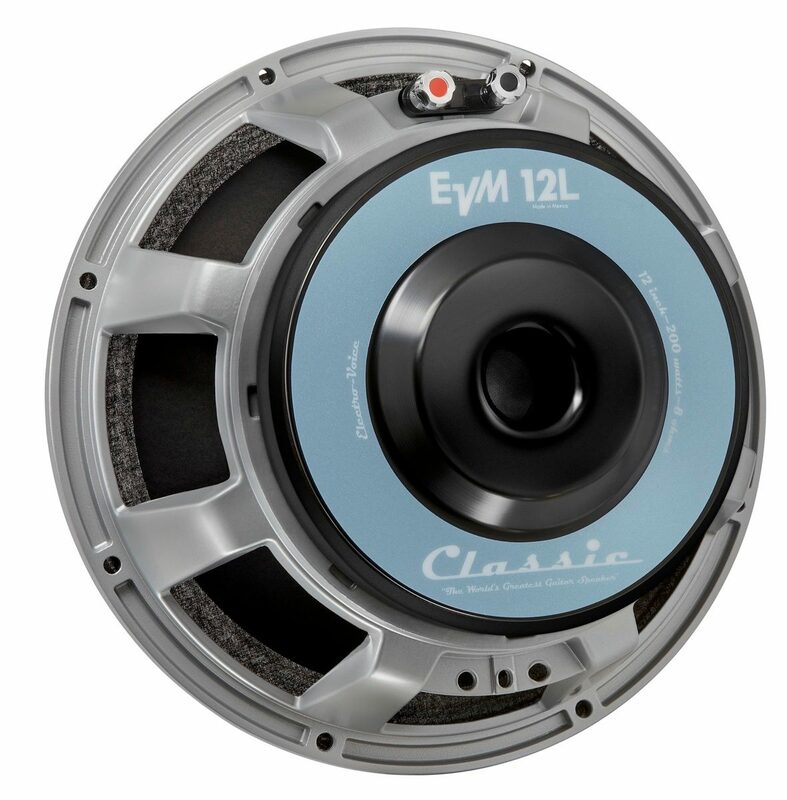 The Electro-Voice EVM12L Classic is a 200-watt version of the original EVM12L Pro-Line. Designed for professional high-level, high-quality musical instrument and sound reinforcement systems. Used full range, the EVM12L Classic's frequency response is specially tailored to cut through the thickest mixes. The EVM12L Classic incorporates voice coil and suspension refinements for reliable operation. Power capacity is rated at 200 watts and features a rugged 8-spoke diecast aluminum frame with a heat radiating back cover. "flooded out send it to a good speaker repair shop a for 125 dollars you have the same new speaker"
Sound: This is my favorite all time Guitar and P.A. speaker. It sounds good at low or high volumes and lasts for years. I have been using one for 35 years ten of which six nights five hours a night. Its cast frame and heavy construction and clean sound puts it shoulders above most other speakers. I use this and a “Weber Beam Blocker” for my Guitar amps. I also use these in my P.A. cabinets. I have yet to use Weber Speakers but have heard that they are a top quality product. Feature: These speakers are work horses they put out what you put into them. If you are happy with the sound of your amp and want that translated thru your speakers they are ideal. Highs are clean lows are tight, not flabby. Ease of Use: Put them in and wire then correctly, make sure if you are using more than one that they are in phase. A note4 to those who have Fender type amps is they are larger than the stock Celestion or Jensen speakers, so make sure you have enough room to mount them. I put one in the bottom of my Hot Rod Deville as I could not replace the top one because the transformer was in the way. I have original Celestion with a Beam blocker in the top and a EVM 12L in the bottom the amp sounds a bit smoother and fuller without doing all the modifications which are advertized. He top rings like a bell and the low E and F sound like a grand Piano Quality: This product is made well although the QC is diminished since Bosh acquired the company. I received the EVM 12L with both the box and speaker incorrectly labeled. I bought the 8 ohm model which was marked 16 ohm. I called Zzounds which was happy to replace the product. I put a ohm meter to the speaker and found out it was actually 8 ohms. I called EV(Bosch) and the technician was already aware of the speaker mislabeling issue. I called Zzounds back and told them although the speaker magnet assembly looked like it was dragged across sandpaper and it was mismarked I would keep the speaker. Value: This is the Best speaker of its kind I have ever used. I have older versions and newer ones. I just re-coned an older one and it sounds great. I have never blown one. It is worh the money.If you do not like it you can always get your money back by selling it Manufacturer Support: Zzounds support is great. EV support seems to have diminished. The technicians are good but it seems that it is no longer the American company which cared very much about its products. I have a dozen EV products and on occasion have called the company. I called and told them the speaker was scratched and mislabeled and it was like”ok we already know” not further help was offered. I The Wow Factor: It is a speaker not a necklace. Overall: If it were stolen I would be pissed. 10 of 10 people (100%) found this review helpful. Did you? Sound: I obtained an old Magtatone amp (push-pull 6BQ5 output tubes so about 18 watts RMS). The 10" peashooter Jensen 10 oz. magnet speaker that came stock with it was blown so I did some jigsawing on the baffle board and managed to make enough room to put an EVM 12L and a bullet tweeter with an almost equally massive magnet structure in there. My aim wasn't just power handling since many car subwoofers are rated as ridiculously high wattage because the coil gap and overhang simply lower the efficiency of the speakers to almost useless - not the EVM though. With that modest amp I can just about keep up with my lead player who plays through a 50 watt Marshall with a 4-12 Celestion cabinet. Watt for watt the EVM 12 is the most efficient speaker I have ever used. I speak from experience because my other amp is an Ampeg Reverbrocket (push-pull 7591s) retrofitted with a JBL K140 and the EVM-equipped Magnatone puts out very nearly the same SPL with considerably fewer watts of input. The transient response and overall tonal clarity of the EVM 12 is unsurpassed. You wouldn't think a 12" speaker with a 2 1/2" voice coil would be able to compete efficiency-wise with a JBL 15" with a 4" voice coil but in fact is does so quite favorably. Your amp is only as good as your speaker and the EVM12L makes the best sound out of the signal that's fed into it. I also recommended the EVM 12 L as the ideal speaker for my freind to put in an old wedge-shaped corner cabinet which he uses with a vintage VM 20 watt hi-fi amp which he uses as a studio recording amp. He is equally impressed as I am with the tone and output SPL of the EVM12L. The old SRO 15s were good enough for Ted Nugent to install in his stacks of Fender Dual Showman amps during the Amboy Dukes era and Arlen Vicelli (lead guitarist with with Salem Witchcraft out of Detroit) also used two Ampeg V4 cabinets loaded with 4 EVM 12L each with an Ampeg V4 head (120 watts RMS) and could shut down any Marshall stack made at the time and this setup would no doubt favorably compare to anything on the market today. Feature: Heavy as sin (but still not bad for the output it produces. Alnico magnets have simply become prohibitively expensive to manufacture so virtually all manufacturers have switched over to ferrite nowadays. The old Alnico magner SRO 12 was a couple of pounds lighter for the same voice coil but hasn't been available new for many years now. Ease of Use: Plug and play - what you hear is what your amp is putting out. Quality: I've never known one to fail except in cases where an output transistor failure has placed rail DC voltage across the coil. Value: You can buy Eminence professional grade that will put out high quality sound somewhat cheaper but in the end you tend to get the level of quality you pay for. Manufacturer Support: I've has occasion to deal with EV before for microphone replacement parts. They seemed quite helpful. Overall: No reason to ever want to ugrade since there is nothing better I could upgrade to. 47 of 48 people (97.92%) found this review helpful. Did you?